Correlate wells using Spontaneous Potential and Resistivity well logs with a greater vertical spread of the La Pascua Section than in Exercises 1, 2 and 3 and close the loop with more wells than in Exercise 4. Subdivide the sedimentary section characterized by the well logs on the basis of the prominent correlatable surfaces (TS, mfs and SB) you can identify. Using these surfaces identify the parasequences within the sedimentary section characterized by the well logs and interpret the history of their evolving depositional settings. Describe the role of relative sea level in forming the resulting depositional settings utilizing the report on the geologic setting of the La Pascua Formation, the introduction to the sequence stratigraphy of the La Pascua Formation and the eustatic chart. The illustrative data to be used for the exercise have been saved either in .pdf, .gif format or .jpg format. These maps and cross-sections can be viewed on electronic media that include PC, Notebook, Tablet, or Pad and interpreted with Power Point. 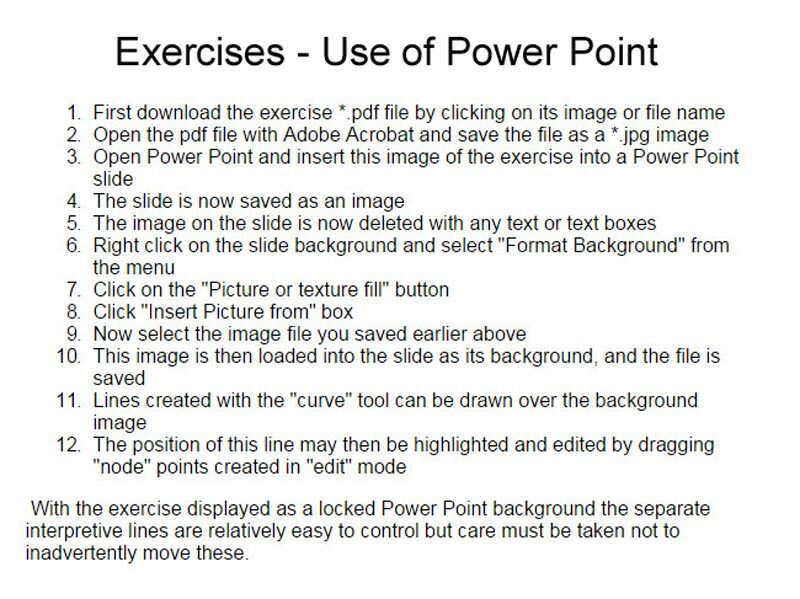 The Power Point drawing tools, in particular curve, are an effective and easy way to handle the objectives of the exercise and a means for collective viewing of results in class. Click on red box for more details. The output can be printed on a large frame plotter and interpreted by hand. These exercise illustrations are quite large (up to 500K in some cases) and they may take a little time to be displayed. Patience will be rewarded!!!! The clickable map below is linked to a pdf file which locates the wells of the three cross sections of this exercise: namely a North-South Dip line and two strike lines a Northern Strike Line and a Southern Strike Line. You can also view and/or print a smaller version of these files by using your visualization software to shrink the images to fit your printer. A report describing the high-frequency (fourth-order cycles) sequence stratigraphy and regional geology of this region is provided in the geologic setting of the La Pascua Formation, the introduction to the sequence stratigraphy of the La Pascua Formation and the eustatic chart. A set of maps of previously interpreted wells is also provided to enable the construction of sand thickness isopachs for each of the intervals. Please refer to the basemap for the location of all the wells. Utilize the Gulf Coast slip-slide method to help you match the log sections and identify the same geologic events on the various wells. The top of the section is marked by the top of the silt that lies at the contact between the Roblecito and Pascua Formations. Color sands yellow and shales green. Correlate using the Event 7 as your basic datum. For each parasequence identify the TSs (transgressive surfaces) and then correlate these on all the well logs provided. These transgressive correlation Surfaces are used in all the sets of exercises. They extend across the area penetrated by the wells, except where they are interrupted by the incision of local channels. These surfaces cap silty horizons that are equated with surfaces of transgression (TS) that formed at wave base, and above, when the sea floor was reworked just following a sea level low. Normally radioactive peaks on Gamma Ray Logs, associated with mfs, are more extensive and often represent better correlatable surfaces but Gamma Ray Logs were not available for much of the Guarico Sub Basin. For this reason you should use geologic logic to infer the location of the maximum flooding surface (mfs) and correlate these on all the well logs. Make a cross-section first correlating the shales for all the wells and then correlating the sands. Identify all system tracts, including the incised valley, on all well logs. For each parasequence (bounded by mfs's) estimate and record the net sand (in feet). Correlations should be made across the entire area delineated by all the cross sections. Tie the stratigraphic dip and two stratigraphic strike sections and build a the correlation framework for the E-logs. These correlations have been tied into existing biostratigraphic and palynologic markers to bracket the age of the intervals and help interpret the depositional setting of the sediments and the frequency of their cyclicity. In contrast the best way to view the QuickTime movies is to control their motion using the arrow keys on your keyboard, the left arrow will step the film back and the right arrow will step it forward. Provide an overall analysis that describes your conclusions. As with the earlier four exercises (Exercise 1, Exercise 2, Exercise 3 and Exercise 4) to help with your interpretation of the well logs you should read the earlier sections related to the geologic setting of the La Pascua Formation and the introduction to the sequence stratigraphy of the La Pascua Formation. From these you will gain knowledge of the depositional setting of these rocks. You should combine the techniques outlined above with your understanding of the regional geology and the vertical and lateral facies relationships in near shore clastic settings (eg. shoreline, beach, stacked beaches, tidal flats, deltas) and Walther's Law. You should use these to build a depositional model and a sequence stratigraphic interpretation of the well log section.